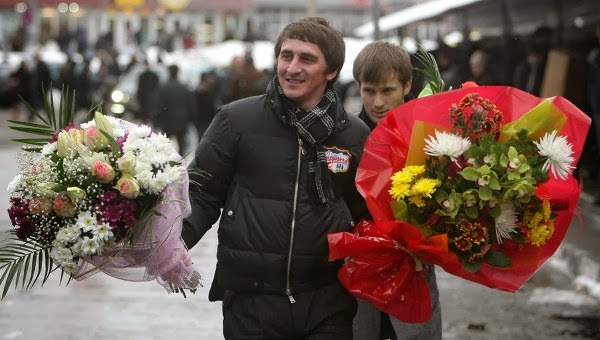 What are these young men doing with those big bundles of flowers, you ask? Who are the lucky recipients? 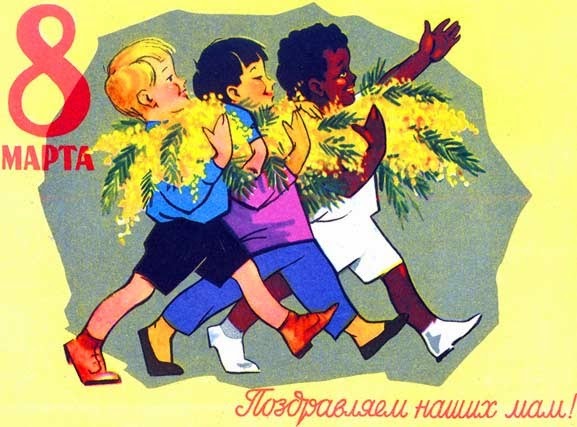 This is a Russian advertisement for Women's Day, a national holiday celebrated on March 8. One might compare it to Mother's Day here in the U.S., only the Eastern Europeans celebrate ALL women, including mothers, grandmothers, daughters, and even co-workers. It's an international celebration of economic, political, and social achievements of past, present, and future women. In Russia, it's not only their #1 flower holiday (exceeding Valentine's Day and Mother's Day sales combined), but it's also a day to shower women with love and attention, offering them a day of pampering and rest from the cooking, cleaning and motherhood responsibilities. Women put up their feet and are treated like princesses! Believe it or not, Women's Day began as an American holiday in New York City in 1909. It was embraced by Eastern Europe after the 1917 Revolution. Although the holiday hasn't become what it is in Europe here in America, the day is making a comeback as a day of social awareness, celebrating the achievement and advancement of women. In fact, the "tagline" for the American holiday is "Love, Honor & Respect." Wouldn't you love to be pampered like those Russian women? On March 8, Cactus Flower will be doing its part to shower all women with affection. Every women who steps foot into our stores that day will receive a red rose. We'll also have a beautiful selection of bouquets for you to send to any woman in your life who inspires you. You can follow Women's Day happenings around the country on Twitter at @womensday, or search for events and info using #womensday.